Far from a throwaway throwback, For All Kings shows Anthrax sounding like their classic lineup but evolved for 2016. Vocalist Joey Belladonna replaced Anthrax’s original vocalist Neil Turbin after the band’s first album and helped make the band one of the Big Four Thrash Metal bands of the 1980s (a list that also includes Metallica, Megadeth and Slayer) with his distinctive voice and dynamic range. Anthrax were metal pioneers who managed to not sound like any other metal band out there (partially because Belladonna’s previous gig was in a Journey cover group, if you can believe that). Belladonna was controversially replaced after the band’s 1990 release Persistence of Time with another dynamic singer, John Bush of Armored Saint. 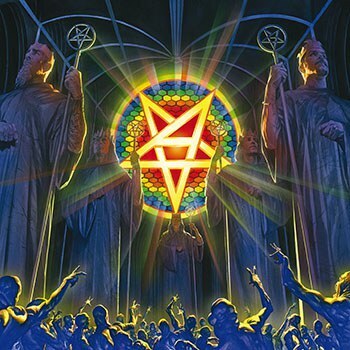 Time showed a new direction for Anthrax and Bush fit the mold arguably better than their best known singer. Anthrax persisted through time and some excellent albums with Bush (and occasional reunions with Belladonna, and then Bush again). With Bush unwilling to come back to the band and their replacement singer not quite working out, Belladonna was enticed to return for Anthrax’s tenth album Worship Music (2011) and the cover EP Anthems (2013) effectively re-reuniting (most of) the classic Anthrax lineup. Now, in 2016 we are given For All Kings, the band’s 11th full-length studio album featuring Belladonna on vocals along with founder Scott Ian on rhythm guitar, songwriter Charlie Benante on drums, Benante’s nephew Frank Bello on bass and newcomer Jon Donais on lead guitar (the only current member not of the “classic” lineup and his first album with the band). Of course, For All Kings is both luckily and tragically released during a period when classic metal bands are releasing new albums left and right. 2014 marked the release of Judas Priest’s Redeemer of Souls, 2015 saw new albums from Iron Maiden, Motorhead, Slayer and John Bush’s own reunited Armored Saint while 2016 has already seen the release of Megadeth’s new album. Even Metallica has promised a new album in the near future. So how does Anthrax’s For All Kings stand out or stack up? The easiest thing to do in reviews of this kind is point out that “It still sounds like [Insert Name Here]” and luckily that is the case with Anthrax. With an album like For All Kings and a band like Anthrax, there is no singular sound to cite. As in the band’s heyday with Belladonna in the 1980s, For All Kings stands out as powerful thrash metal with a distinctive sound that is unmistakably Anthrax. True, the band has its fair share of darker lyrics about burned and melted halos and murder and mayhem, in keeping with their latter-day pentagram “A” symbol, but Anthrax is not a band to attempt to emulate all the rest. Many might expect For All Kings (and their previous two releases) to sound like something of an evolution from Persistence of Time and, to be sure, that element is present. It’s hard to imagine this Anthrax donning colorful surfing shorts and performing more comedic songs like "I’m the Man". However, this is not simply a throwback to the Belladonna albums. Instead, For All Kings proves to be an evolution of the band on the whole, taking cues from the Bush era as much as it does the classic era. In fact, possibly as a result of so many performances of the Bush era hits like “Only” on Anthrax’s tours, Belladonna’s voice has morphed into something of a hybrid between Bush’s deeper vocal style and the classic high-pitched wail Belladonna (and Anthrax) was known for in the 1980s. What’s more, Anthrax remains true to their longtime messages without welching on them in exchange for the current array of metal topics. On “Zero Tolerance”, the band continues their outrage about social injustice and political corruption, calling out specifically the killing of children. “Breathing Lightning” is perhaps the song that sounds the most like 1980s Anthrax with Belladonna’s voice carrying the melodic song through talk of “the right thing” while Donais’ lead guitar matches him in pitch and ascending harmony. “You Gotta Believe” kicks off with a beautiful orchestral arrangement before shifting into the hard driving metal that the album showcases. This opening track is a showcase of not only the band’s musical diversity (stretching from thrash to rock to near-classical) but also the complexity of the band’s lyrics. The melodic metal is showcased again on “Blood Eagle Wings”, which layers each instrument throughout its introduction and matches Belladonna’s melodic voice (which descends into a growl for the more disheartened lyrics). The song’s rousing guitar solo breaks out of nowhere and carries the band into the stratosphere before returning to the impassioned chorus. Yeah, Donais is given the chance to prove that he was the right choice for the band’s lead guitarist and he does prove exactly that. All of this is before a beautiful, minimalist outro that punctuates this strong track. “This Battle Chose Us” is another standout with an infectious chorus and strong, self-assured lyrics without any sort of macho swagger. Belladonna screams “You give ‘em hell! This battle chose us. You can’t choose your battles.” Anthrax wins on this one. While For All Kings is an overall positive album lyrically, it’s not exactly a happy one. Even “Blood Eagle Wings” prominently features the repeated reference to “darkness in my soul”. “You Gotta Believe” features Belladonna crying out, “You’re just a bag of blood and I’m holding the nail.” “All of them Thieves” includes the lyrics “I will destroy everything” as part of their social outrage and the title track says “all the darkness, inside of my world breathes and I can’t leave”. Of course, this is metal and the only real question is whether or not this darkness works. The answer is that it does. Like the best of Anthrax, For All Kings balances the band’s darkness with optimism. With music this proficient (and it is that), the end result would be a fine result anyway, but with the lyrics as poignant and interesting as these, addicted fans will be perusing the lyrics sheets not only for meaning but to sing along at full volume. For All Kings is a great listen, but like many of the more serious and darker albums in Anthrax’s quiver the record is somewhat lacking in “fun”. One might find “fun” a tall order when it comes to thrash metal. After all, one doesn’t listen to Slayer’s library looking for an encoded joke book or tunes about happy clowns giving rainbow balloons to lollipop eating children at a petting zoo. But this is Anthrax and “fun” has often been a huge part of their repertoire. After all, you don’t expect to see the big-headed, mustachioed, laughing “Not Man” running around warming up the crowd at a Slayer show either. That said, For All Kings is a cohesive and consistent metal album that works on multiple levels. This is no throwaway throwback, but a solid and powerful next step for this classic and innovative metal band. Yes, they are building upon their own legacy and that legacy is still going on strong, so those looking for the more “fun” side of Anthrax are welcome to roll on back to the I’m the Man EP or the more recent Anthems EP for that bit of enjoyment. In truth, these stand up very well alongside For All Kings and help prove this band’s diversity. As the chorus of the exceptional track “Suzerain” proudly cries, “Nothing is over”! Those predicting Anthrax’s demise after Belladona’s or even Bush’s departures have been proven wrong. The end of Anthrax is clearly nowhere in sight and For All Kings proves not only that the band is still in their prime, but that once again, Joey Belladonna was the right choice for their new (old) singer. After all, Anthrax should still sound like Anthrax and Anthrax doesn’t quite sound like any other band. Give ‘em Hell, Anthrax.